The Corvette Action Center started out in April of 2000 as an online resource for Corvette owners and enthusiasts, and has grown into the largest Corvette site on the Web. With its attractive and efficient layout, exclusive articles and vast amount of technical information, it has quickly become an invaluable and unbeatable resource to the Corvette community. From first-time Corvette owners to seasoned Corvette afficianados, we have a reputation for being the ultimate online hub of Corvette news and information. The prime directive of the Corvette Action Center is to promote the awareness, preservation and enjoyment of the Chevrolet Corvette and help educate owners and enthusiasts by providing a professional and reliable online source of Corvette news and information. We consider the Corvette Action Center to be a major informational repository and in a "continuous state of improvement". The information contained within is constantly being updated in order to insure that it is reliable and consistent. The engineering of the site is also under a constant state of development in order to make room for future additions and to insure that site navigation and access is quick and intuitive. Ad Statistics Reporting - Our ad delivery system has extensive reporting features to allow you to track the effectiveness of your ad campaign. Once you become a site advertiser, you will receive a weekly report via email containing banner impressions and click through statistics. Consistency - Your advertisement cannot be bypassed and ignored by "breaking out" of a frame set and our dynamic ad delivery system is compatible with all browsers, not just certain ones. High Traffic - Because the Corvette Action Center is linked from hundreds of other web sites and search engines, has been mentioned in leading automotive publications, and is always being updated, it generates an incredible amount of traffic on a daily basis. As we add more valuable features and content, traffic continues to increase. Longevity and Stability - The Corvette Action Center started out in April of 2000 as an online resource for Corvette owners and enthusiasts, and has grown into the largest Corvette site on the Web. With its attractive and efficient layout, exclusive articles and vast amount of technical information, it has quickly become an invaluable and unbeatable resource to the Corvette community. From first-time Corvette owners to seasoned Corvette afficianados, we have a reputation for being the ultimate online hub of Corvette news and information. Quality Content - The Corvette Action Center is committed to providing top quality information and content that can't be found anywhere else on the Web. Quality People - The Corvette Action Center attracts a valuable audience of well-educated automotive enthusiasts interested in information about Corvettes and performance cars in general. Most of our visitors are Corvette enthusiasts, but a portion of our user base are GM performance enthusiasts. 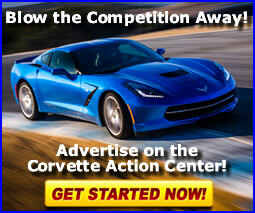 Targeted Advertising - Advertiser images at the Corvette Action Center receive excellent visibility! Ad images are displayed in or near the navigation area on every major page of the site. Not only that, but we have very flexible advertising plans tailored to meet even the smallest budget. This gives companies of any size a terrific opportunity to gain more exposure for their products and services. Add it all up, and it only makes sense to promote your products and services with us. Uptime - The Corvette Action Center has a 99.99% uptime record and only comes offline in the very rare case of brief system maintenance and software upgrades. We use business-class hosting on a very high speed network to ensure that your advertising campaign is uninterrupted. We are always willing to work with you and your company in developing the best advertising program to suit your needs. If you need an advertising banner, we can build one for you for a one time $25.00 fee. Please be sure to read our Terms and Conditions of advertising on the Corvette Action Center. If you have any questions or suggestions, please feel free to contact us and we'll be happy to work with you. Location - Top middle of all pages on the web site. If you cannot supply a pre-made banner for advertising, we can build an ad banner for you. The cost is a one-time flat fee of $25.00 per banner regardless of type, size or function (animated vs. static) of banner.